Unless you're in one of those BS states that never has winter (get out of here, Florida), right now, you're probably huddled under three blankets, still cursing the frigid slush puddle you accidentally stepped in this morning. 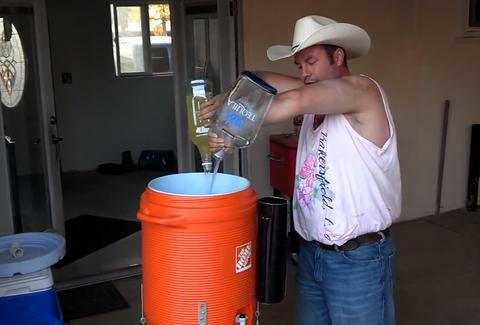 Reddit wants to help you remember warmer days, so they unearthed this glorious video of a national hero demonstrating his redneck margarita machine. For those unfamiliar, a redneck margarita machine is an ingenious device which merges a water cooler with a garbage disposal to produce enormous batches of fresh margs. Though the man in this video isn't the first to construct one, he's probably the first to do so while wearing a cowboy hat and jorts, surrounded by several confused dogs. Watch the incredible events unfold above as you crank your space heater, dreaming of another wet hot 'Merican summer. Kristin Hunt is a Food/Drink staff writer for Thrillist, and really admires the craftsmanship on this thing. Follow her at @kristin_hunt.